I started working at this org at the end of January. 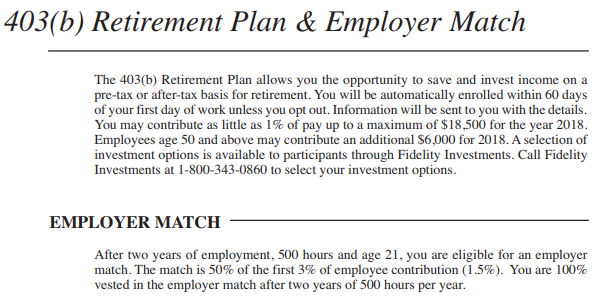 I was wondering when I will be eligible for the defined contribution plan, and the 403b match. I am kind of confused, thought maybe someone could shed some light on this for me. I currently am making around 50k and plan on contributing 15% of my paycheck to retirement. 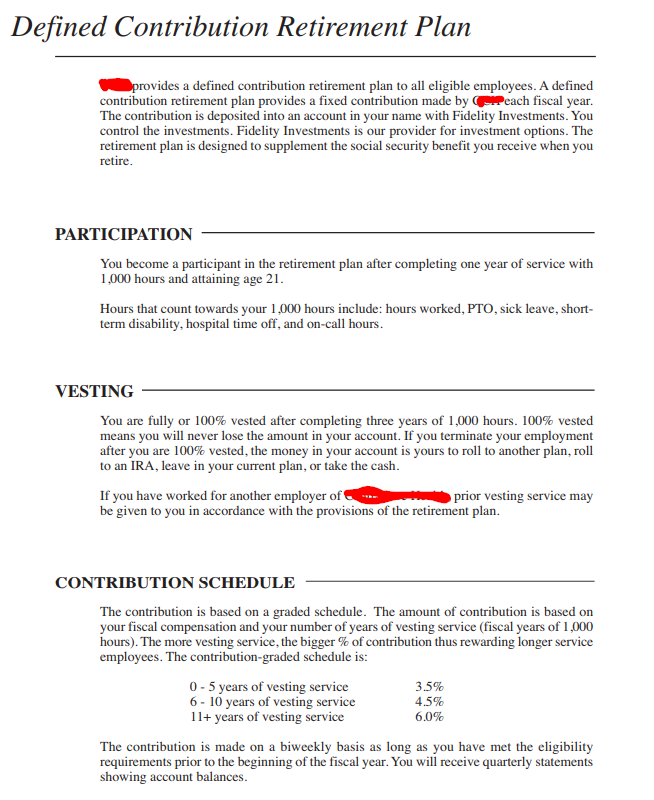 Based on the image you posted, you are eligible for the defined contribution plan (pension) after 1 year of service, provided you are over 21 and worked at least 1,000 hours in that year. You are eligible to contribute to the 403(b) after 60 days, but are not eligible for the match until 2 years of service (again provided you worked 500 hours and are over 21). The vesting period refers to how much of the employer contribution you get to keep should you leave the company early. For example, if you leave the company within three years of your hire date, you will lose any pension amount that has been received. However, the 401(b) match only gives you a 50% match on the first 3% of your contributions. At a presumably young age (and relatively low tax bracket), you would be better off to put the other 12% into a Roth IRA. You will not be able to deduct the contributions from your taxes now, but the earnings will grow tax-free, which can save you enormous amounts of tax at retirement age. You also have more choices of investments in a IRA versus a 403(b). You can find many answers on this site regarding what to invest in when you are just starting your retirement investment strategy. Not the answer you're looking for? Browse other questions tagged united-states retirement-plan 403b or ask your own question. Can a 403b contribution be rescinded?